I love pizza. I miss good pizza. Being from Chicago you don’t realize that there is really bad pizza in the United States. No, seriously bad pizza. I don’t understand how I could move 5 hours away, but the pizza does not even resemble, well, pizza. So, to my dear family that I know reads my blog (right???? ), this is NOT Ed and Joe’s Taco Pizza. I’m sorry. This is mom’s recipe though, so if you’re unhappy blame her. We always blame our mothers when something is wrong. But, trust me, you won’t be calling her and criticizing this pizza, you will be telling her how delicious it is! Okay, scratch that. You won’t do that because we always forget to say THANK YOU for the good things in life (funny how we never fail though to complain when something goes wrong). Anyways, you can whip up a pizza like this in no time by making crust from Pillsbury or Better Crocker!
. I use two envelopes of the Betty Crocker and press them into a large cookie sheet (with sides). Of course I use my Pampered Chef large bar stone. Wow, this paragraph is like one big advertisement. Moving on, make this pizza for dinner. Then, eat the entire pizza. Then complain that your pants don’t fit. Then call mom and blame it on bad genes. Prepare pizza dough according to package (use two pouches if not making from scratch). Press dough into a large cookie sheet (sprinkled with corn meal) or jelly roll pan, with sides, with extra dough on the edges. When pizza pan is prepped with dough, poke fork in dough all over. Bake in a 425 degree oven for 10 minutes. (dough will not be completely cooked yet). While dough is baking, brown beef completely then drain. Add taco seasoning and water and let simmer 5-10 minutes. Drain again.Top dough with drained ground beef, chopped green chilies and 2 cups of the shredded cheese. Bake an additional 10-15 minutes (until crust is golden brown). Remove from oven, cut into squares before adding toppings. Then top with lettuce, tomato, and remaining cheese (black olives are good too, but then I really would have had to eat the whole pizza by myself). Enjoy! 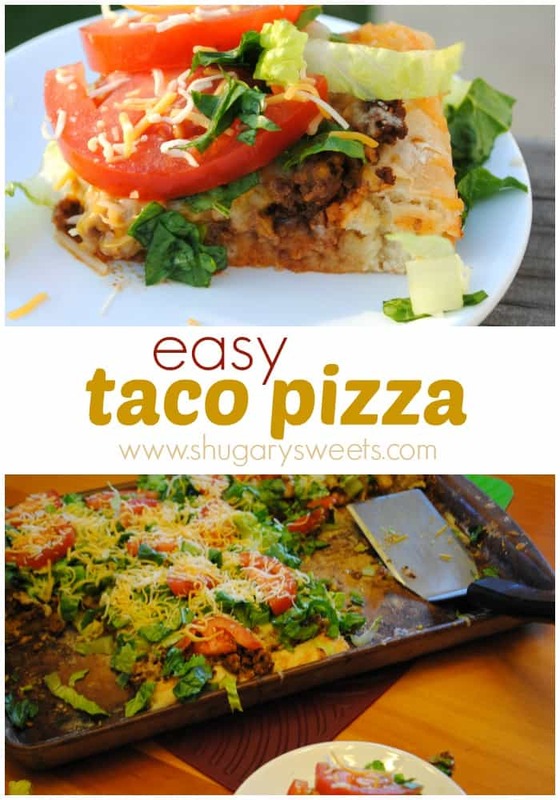 Taco Pizza – yummmmmy! I love this kind of meal. It definitely brings back memories of my childhood too. My Mom did a lot with Bisquick…LOL. I got this one bookmarked! I definitely want a piece of that! Wow, Aimee, that looks perfect. Taco pizza is amazing when done right, and Ed & Joes and Mom are the only two I’ve encountered done right. Looks like a third contender now. PS. Really like the new look. Since we use Blogger, too, I know they have a search gadget you can add. You should put one on. 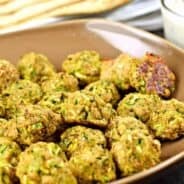 If someone wants to look up a recipe, they can just search for it. Thanks Ty! I will look into that search gadget…. Two of my FAVORITES IN ONE DISH. I would love to have this right now instead of my Lean Pocket. Now that is my kind of pizza. Looks wonderful. 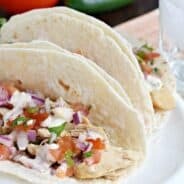 We love tacos at our house and I have never thought to put it on a pizza, but that is a fantastic idea. Can’t wait to try it! 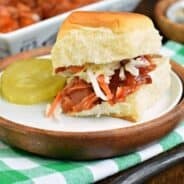 I am a new follower and would love a follow back at The Farm Girl Recipes. Thanks!! 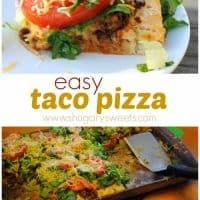 Taco pizza is one of my favorite foods in the whole wide world! My husband on the other hand just doesn’t “get it” and won’t touch it.He thinks lettuce on pizza id just weird. I just think it’s yummy! Tacos are my brother’s favorite food and I love them too. I’ll have to make this sometime when he’s visiting because I’m sure he’d love it. Thanks for the idea! I have been on the look out for a taco pizza. So glad I found you over at the Ultimate Recipe Swap. I don’t even know how I finished up here, but I thought this post was great. The perfect recipe to satisfy all cravings! Yum!